Stock ponds are ponds that have been constructed in rangeland settings to provide a water source for livestock. Enhancing existing stock ponds can result in improved water quality for livestock and the creation of wildlife habitat. 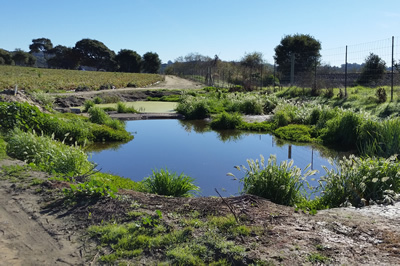 Ponds can be magnets for wildlife, large and small, and on the Central Coast, such ponds can provide important habitat for protected species such as California red-legged frogs and California tiger salamanders. Tree frogs (aka chorus frogs), birds, bats and other mammals also benefit greatly from the water availability and habitat provided by stock ponds. Enhancing stock ponds to benefit livestock drinking water quality typically only involves fencing off the pond and providing a trough that draws water from the pond by the use of a pump or gravity (referred to as an “off pond watering system”). Enhancing stock ponds to benefit wildlife can also include fencing off the pond, but with a “wildlife friendly” fence. Vegetation in the fenced-off area provides food, nesting habitat, and cover for insects, birds, and other animals. Stock pond enhancement projects can be effective on ponds of any size and water holding capacity, although the scale of effort (i.e. fencing, off pond watering system, planting of trees, shrubs, grasses, forbs, rushes and sedges) of this practice should be adjusted to match the pond’s water-holding capacity and duration. In general, fencing off the pond and providing for an off-pond watering system will give the landowner the most benefit to his/her operation. The extent of planting is determined by the conditions of the site, the ability to provide supplemental irrigation, and the desire of the rancher to devote some time to regular maintenance. Repairing or enhancing existing stock ponds can be expensive and may require several permits. The RCD of Monterey County, in Coordination with The Natural Resources Conservation Service (NRCS) and the US Fish and Wildlife Service (USFWS) can provide technical and financial assistance for eligible projects through their EQIP and Partners for Fish & Wildlife programs. When deciding how to enhance an existing stock pond for native amphibians, you’ll need to consider several factors. For example, ponds that never go dry can give invasive species, such as bullfrogs, hybridized tiger salamanders and introduced fish (which all have insatiable appetites) a competitive advantage over native species. Alternatively, ponds that do not pond long enough can hinder native amphibians’ ability to reach metamorphosis. In response, Biologists typically recommend measures that allow ponds to be dry for 1 to 3 months each year, mimicking California’s seasonal water cycle. The hydro period is one of most important aspects of stock ponds for native amphibians in our area. You can meet these hydrologic recommendations by reshaping, re-excavating, repairing an embankment or installing a drain in your pond. Planting trees, shrubs, grasses, forbs, rushes and sedges around a pond can improve both water quality, and wildlife habitat.